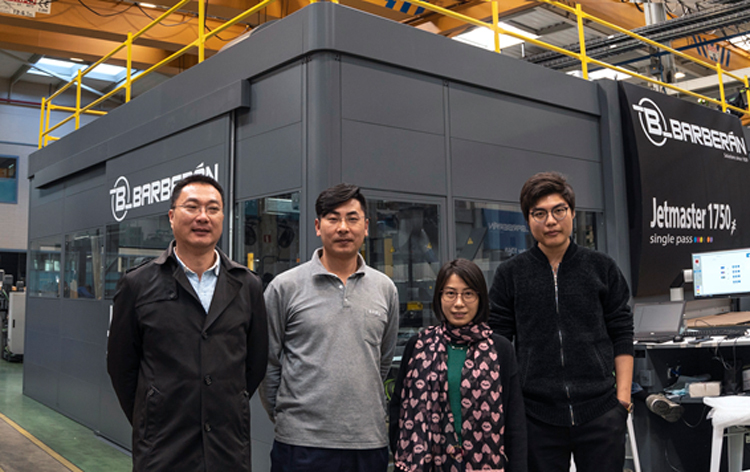 Greentec, from Qingdao, province of Shangdong, has bought the first Jetmaster digital printing press that will be installed in China. The IT crew that will work with the press have come to Barcelona for a training previous to the shipping of the line. The Jetmaster 1260 prints in six colors (CMYK, light cyan and light magenta), which allows a broader chromatic range, with UV inks, and has a width of up to 1260mm. Jetmaster printing technology is based on Single-Pass, which allows to print digital images directly onto multiple surfaces without direct contact with the piece. This enables high speed production for industrial levels. With it, Greentec will mainly make decorative panels on different substrates, which will be supplied with different types of finishing with the line that Barberán has also installed, and which allows finishes from matt to high gloss.